Parliamentary Secretary for Disabilities and Carers, Senator Jan McLucas and Member for Grayndler, Anthony Albanese today joined children and families at The Infants Home in Ashfield to see first-hand how early intervention programs are helping local children with disability get the best start in life. Operating for more than 138 years, The Infants Home provides early intervention services and early childhood education and specialist health services to more than 1300 children living with a disability. The Home is also a provider of the Federal Labor Government’s Helping Children with Autism and Better Start for Children with Disability initiatives and provides a support network for parents and carers through the Federal Government’s MyTime program. Federal Labor Member for Grayndler, Anthony Albanese said The Infants Home was making a real difference in the lives of local families and children with disability. “We know that early intervention services are vital in helping children reach their full potential,” Mr Albanese said. Emma is the mother of three year old Harry who has profound developmental delays and impaired vision. “The Infants’ Home makes a point of including Harry, and I’ve seen them do it with other kids with disabilities too. It is a beautiful, inclusive environment. You can’t imagine how comfortable and confident this makes us feel,” said Emma. Senator McLucas said the Helping Children with Autism and Better Start for Children with Disability initiatives provide up to $12,000 for families to access early intervention services and therapies for their young children. “Every parent wants the best for their child and this package is helping to ensure that children with disability receive support during the most critical period of their development. However, a big challenge for many local families is the cost of accessing early intervention services. That’s why our decision to expand eligibility for the Better Start program is so important. “From 1 January this year, hundreds more children with disability are now eligible for critical early intervention services and therapies. “Our Government’s $13.4 million boost over five years means that children diagnosed with Prader Willi, Williams, Angelman, Kabuki, Smith-Magenis, CHARGE, Cornelia de Lange, Cri du Chat syndromes and microcephaly can access Better Start funding for the first time,” Senator McLucas said. Senator McLucas and Mr Albanese said the Federal Labor Government would continue to focus on supporting these children and families in the early years as it works to build the National Disability Insurance Scheme (NDIS). “The National Disability Insurance Scheme will focus on making sure early intervention services are available to families when they need them, so children start on the right foot,” Senator McLucas said. Mr Albanese said the NDIS will fundamentally change the way we support people with disability, their families and carers. “The Gillard Government knows that people with disability, their families and carers have waited too long for change,” he said. “That’s why we are delivering $1 billion for the first stage of the NDIS. This year, the National Disability Insurance Scheme will become a reality for thousands of people with disability, their families and carers in select locations across the country. By 2018-19, more than 140,000 people with disability in New South Wales alone will benefit from the NDIS. For more information on Better Start, Helping Children with Autism or the MyTime program, visit www.fahcsia.gov.au. 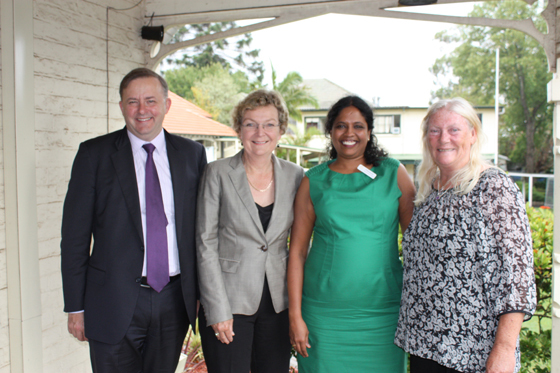 Photo shows Anthony Albanese and Senator Jan McLucas with Anita Kumar and Lynn Farrell from the Infants Home.